Canada exited the Cup round after losses to Fiji and Samoa but managed to double their take in series points from previous tournaments, claiming 10 points. That leaves them in 11th place with 20 points from 3 tournaments, chasing Spain in 10th with 22 points. Canada only won one match at the tournament, against last place Japan, but the tie with Spain in their first match and a better point differential than Spain saw them enter the Cup round. Canada are in an interesting pool next week in Sydney with USA, Kenya, and France. USA are top of the standings, tied with Fiji but their star player Perry Baker suffered a broken jaw in the match versus Tonga and will be out of action for a while. It's to Canada's advantage to see USA finish top 4 in the series as it removes them from the NACRA Olympic qualifying tournament. Kenya are in 13th place and finished 10th in Hamilton, like Canada they had some labour issues but their star players remain sidelined and they have a young team at the tournament. They did well on Day 2 knocking off Argentina but losing in the Challenge final to England. France are in 12th place in the standings but had a poor performance in Hamilton, losing the 13th place final to Tonga to finish 14th. Fiji went on to win the tournament and they brushed Canada aside in the Cup QF. Canada started Fuailefau, Mullins, Kaay in the forwards, Braid, Douglas, Hirayama, Kay in the backs. Fiji scored within 20 seconds and it exposed the defensive frailty of Canada. Something they'll have to correct if they want to move up the rankings this year and consistently make the Cup round of tournaments. Braid scored Canada's lone try and he was Canada's player of the tournament, taking the lead in showing some Canadian grit and physicality. Canada started Fuailefau, Zaruba, Berna in the forwards, McCloskey, Braid, Kay, Douglas in the backs. No sign of Hirayama in the match day 12, Josiah Morra was brought into the reserves bench. We'll find out how serious the injury to Hirayama is. Samoa opened the scoring in the first minute with a few broken tackles and offload to the support player. Kay and Braid teamed up for Canada's try, the top two players for Canada in the tournament. Samoa hit back, ball carrier again beating the tackler and then offloading. Samoa scored one more before the half and at 21-5 the match was slipping away. Coach McGrath could be heard in the half time huddle, "not acceptable at all" as he chided his players. McCloskey got Canada on the board first, stepped a defender after Braid had taken out two defenders with a hard run and offload. Canada gave a brief glimmer of hope when they scored next and closed the gap to one score 21-19 when Berna was the extra man on the overlap and touched down. It wasn't to be and perhaps fitting that Canada's poor tackling and defensive tracking would be their final undoing at the tournament in a try that won't be on the Canada highlight reel. Canada got into the Cup round by the slightest of margins, they tied Spain 12-12 in their opening match which meant point differentials would likely decide who advanced. The likely scenario was both teams would lose to NZ but both defeat Japan, that's the way it went but Canadian hearts sank when NZ put a 49-10 thumping on Canada in a match where the Canadian players couldn't have knocked down a tackle bag with their level of physicality. On the other hand Spain just narrowly got by Japan 22-19 setting up a -42 point differential in the third round that Canada had to overcome. Canada did its part with a 26-0 win over Japan and now needed NZ to win by 17+ over Spain. It didn't look promising in the first half as the Spanish players tackled everything that moved and their team defence was outstanding. They couldn't keep it up for the second half however and NZ scored four tries to present Canada a trip to the Cup round. Canada started the Spain match with Mullins, Fuailefau and Kaay in the forwards, Braid, Douglas, Kay and Hirayama in the backs. It was all Canada in the first half and they could have put Spain away with a little bit of precision in their passing but came out of the half only 5-0 ahead. The Spanish defence was swarming and it's the aspect of their game that has boosted them ahead of Canada in the standings so far this season. Spain scored first in the second half and it was off a turnover from sloppy breakdown work between Kaay and Braid. Kaay put Canada ahead when Hirayama floated a perfect pass to the outside for him to run on to, it was now 12-7 with 3 minutes left. Spain tied it up with a minute left in the match and were pressing on attack when the Spanish player had a bit of brain fart at the whistle and kicked it out thinking they were ahead. The camera panned to the coach who was doing a face palm. Canada got a bit lucky there. Canada should have put the game away in the first half but a lack of precision with passes not going to hand, knock-ons plus a tenacious Spanish defence kept the game close and a tie for Canada wasn't a bad result in the end. The NZ game was awful, it started poorly with NZ taking a Hirayama kickoff that didn't go the distance and running it straight in for a try while would be tacklers just gawked. The rest of the match wasn't much better. Cole Davis got his first try and in the end the 10 points Canada did score would be enough to put them through to the Cup round. The match video is below from CBC Sports. The Japan match was one that Canada needed to win by a large margin and to their credit they came through with a complete team effort, the bench was cleared and everyone contributed. Starting in the forwards were Fuailefau, Zaruba, Berna with Braid, Douglas, Hirayama, Kay in the backs. The game started nervously with Zaruba dropping a low pass but Japan returned the favour. Pat Kay and Connor Braid were putting some extra zip into their charges into the line as they tried to find holes in the Japanese defence. Kay setup the first try with an offload to Hirayama in support, 7-0 with 12 minutes left. Connor Braid setup the second try and offloaded to Justin Douglas to cross the line, 14-0 with 9 minutes left. Zaruba dropped another low pass to end the half and Canada have another 7 minutes to increase the differential. Zaruba finally gets a pass in the chest area with some room to move and he bulldozes his way to a try in the corner, conversion missed, 19-0 with 5 minutes left. Berna makes a great try saving tackle that keeps Japan off the scoreboard, 3 minutes left. It's getting nervous with 2 minutes left as Japan are on attack and threatening to score, Pat Kay with a great effort at the breakdown wins a penalty, that would prove to be crucial. The subs are all on now, Hirayama and Douglas the only two starters left. Six seconds left McCloskey makes the break and looks to be in but gets run down from behind and Japan win the ball. The hooter blows but fortunately Japan want a try so play continues. Canada run up a string of penalties and Japan keeps the game going, they eventually make a break but Hirayama makes the tackle, steals the ball and dishes off to Douglas who puts those precious extra points on the board, 26-0 and now Canada just waits and hopes NZ are on their game against Spain. The match video is below from CBC Sports. Fortunately NZ came through in the second half of their match to score 4 tries and blank Spain. Canada now face Fiji in the Cup QF. Cole Davis was probably the most impressive player on the recent Maple Leaf development tour to South America. 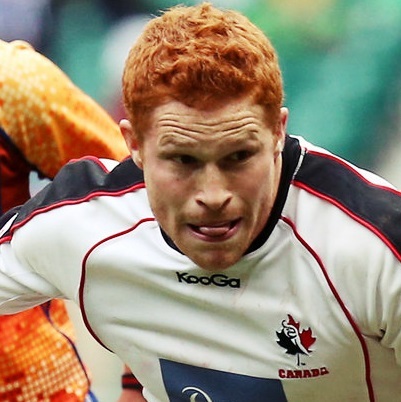 He accounted for almost half of the tries for Canada on Day 1 at Punta del Este. He picked up a leg injury in the process and saw limited action afterwards. He did enough to warrant selection to the senior side and the chance to claim his first 7s cap. At 21 years of age he's already been capped 6 times for the national XVs program but with wingers like DTH and Taylor Paris ahead of him he was mostly selected for ARC matches when the international players were not available. Brock Webster was also impressive on the South America development tour and his performance earned him a spot and a chance for a first 7s cap. The team is travelling with 14 and only 12 dress per tournament so it's wait and see when their chances come. Phil Berna and Mike Fuailefau return from extended injury, Berna had his first run out with the James Bay club last weekend in their loss to the Ravens. Harry Jones is expected back for the Vegas/Vancouver stops. The video below shows head coach Damian McGrath being interviewed by Bryan Kelly as he talks about the selections and future prospects. CBC Sports usually carry the online stream of the matches but that hasn't been confirmed in the Rugby Canada release. The matches take place at reasonable times starting with 3:14pm PT on Friday the 25th (26th local time) vs Spain. Canada have a very strong chance of making the Cup QF, requiring wins over Spain and Japan. Spain have started strong and sit in 9th place, three spots ahead of Canada in 12th. Langford, BC (January 16, 2018) – Canada Men’s Sevens Team head coach Damian McGrath has named a 14-man travelling roster for the next two stops on the HSBC World Rugby Sevens Series in Hamilton, NZ and Sydney, AUS. Canada will once again be captained by veteran playmaker Nathan Hirayama, who tallied 45 points in the opening two stops on the series. Canada opened the Tokyo 2020 qualifying season with back-to-back Challenge Trophy semi-final losses in Dubai and Cape Town and currently sit in 12th place. McGrath will be without the services of Lucas Hammond, Admir Cejvanovic and Harry Jones, who are sidelined due to injury. Two of McGrath’s charges – Mike Fuailefau and Phil Berna – have returned from lengthy injuries to bolster the roster; Fuailefau has been unavailable since the 2018 Rugby World Cup 7s in San Francisco while Berna has not featured on Canada’s squad for over a year. Alberta’s Cole Davis and Ontario’s Brock Webster could potentially win their first sevens caps for Canada after being named to the long list. The two recently returned from two weeks in South America playing with the Canada Maple Leafs development team. Canada opens the pool stages in Hamilton against Spain, hosts New Zealand and Japan in Pool D.
Single day tickets for the fourth annual HSBC Canada Sevens at BC Place in Vancouver, BC on March 9-10, 2019 officially went on sale yesterday and can be purchased at https://www.canadasevens.com!